UNITED STATES: Dominion Virginia Power, Fishermen's Energy, and Principle Power each received an endorsement of their offshore plans in the form of $47 million grants from the Department of Energy (DOE). However, securing power purchase agreements (PPAs) on time is going to be vital if the projects are to come to fruitition. And the US has no offshore utility-scale projects. "I don't think that any banker in his right mind would fund an [independent power producer's] offshore project with no PPA," said Bruce Hamilton of Navigant, principal investigator for the latest annual Offshore Wind Market and Economic Analysis for the DOE. During the first year, each project will receive almost $7 million. For the remainder, they must show they can get a PPA, most major federal and state permits, and finish their engineering. Each project must be online by 2017. No offshore PPA has been inked in the US since February 2012, noted Make Consulting's Luke Lewandowski. Still, the cost-shared grants are a huge boost, given that first-generation US Mid-Atlantic offshore projects could cost about $6 million per mehawatt, added Hamilton. Dominion Virginia Power is developing the 12MW Virginia Offshore Wind Technology Advancement Project 41 kilometres offshore. "Dominion probably has the easiest route to a PPA — it's a regulated utility," said Hamilton. The hurricane-resilient design – with US-designed twisted-jacket foundations and Alstom Haliade 6MW turbines — should show reliability, safety and cost-effectiveness, the DOE said. Fishermen's Energy, for some the surprise choice, is proposing a 25MW demonstration project just 4.5 kilometres off Atlantic City, one of the country's busiest tourist resorts. It will use 5MW turbines by China's XEMC, which is offering 70% equity financing. But the New Jersey Public Utilities Commission (PUC) in March refused a permit, citing the uncertainty of DOE's grant, issues with turbines supplier XEMC and the federal investment tax credit (ITC). Fishermen's has launched a legal appeal against the decision. Greg Reinert, PUC spokesman, said Fishermen's costing took both the grant and the ITC for certain. Asked why the PUC did not wait until the DOE announcement, set for May, he said the application took three years and Fishermen's did not ask them to wait. A highly knowledgeable source, however, said the state governor, Chris Christie, has previously deflected controversy by sending contentious issues to the courts. The governor, who backed the state' s pro-offshore wind law, appoints PUC members. Principle Power's 30MW WindFloat is being co-developed by Deepwater Wind, backed by private equity firm D E Shaw. Five Siemens 6MW turbines will be off Oregon in 366-metre deep waters in the Pacific, the deepest project anywhere. It could also be the first cluster of floating turbines, which are cheaper to install and do not need highly specialised ships. Significantly, Principle has negotiated with an industrial off-taker. According to a document Principle submitted to the Bureau of Ocean Energy Management in May 2013, the company started planning infrastructure at Coos Bay port to power South Dunes, a planned combined-cycle natural gas plant linked to the $7.5-billion Jordan Cove LNG export facility. Principle declined to comment on the status of the negotiations. 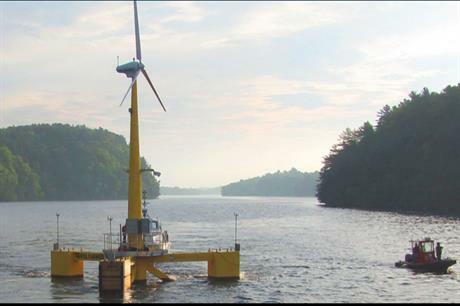 The DOE also chose two more projects for $3 million in research and development help and to step in if any of the three winners lags, the 27MW Icebreaker, by Lake Erie Energy Development Corporation, and Aqua Ventus 1, a 12MW pilot by DeepCwind consortium, led by the University of Maine. Asked whether the funding is too little, too late, Lewandowski disagreed, adding: "Of course everyone would have wanted more money sooner." Walt Musial, manager of offshore wind and ocean power systems at the US National Renewable Energy Laboratory, stressed that the DOE's offshore programme aims to build upon experience elsewhere, not duplicate it: "The projects selected had to demonstrate innovations that either have not yet been deployed in Europe, or are being deployed here in a different way."